Depending on the source consulted, Spanish Baroque painter Juan de Pareja was born in the region of Andalusia, Spain, either in Seville or the much smaller city of Antequera 82 miles southeast, reputedly to a female of African descent and a native Spanish male whose surname he is believed to have inherited. As a teenager Pareja was employed by the celebrated artist Diego Rodríguez de Silva y Velázquez. Sensitive, literate, and perceptive, he served Velázquez well, meticulously cleaning brushes, preparing canvasses, and grinding paints in the artist’s studio in Madrid. Pareja traveled with Velázquez to Italy and was further exposed to the works of other leading artists of his era such as Titian, Veronese, and Correggio. Until recently it had been generally assumed and reported that the relationship of Velázquez and Pareja was that of master and slave. A fanciful story, widely accepted until now, gave King Phillip IV responsibility for emancipating Pareja when the talented mulatto slave cunningly arranged for him to discover an exquisite painting he executed in secret. Interestingly, a similar story is told of the early career of the next most significant painter of African descent in Europe in the 1600s, Sebastian Gomez (1646-1682). In fact, Pareja was a free person. 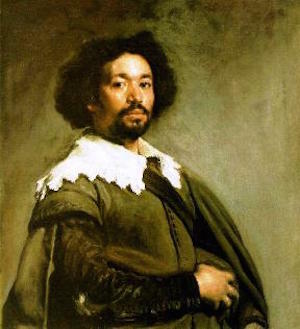 Prior to his arrival in Madrid he passed the examination to be designated a painter in Seville, a profession from which slaves were legally banned. Moreover, in a letter dated May 12, 1630 from Pareja to a high official in Seville, he requested permission to continue studying his craft in Madrid accompanied by his brother, Jusepe, not Velázquez. Pareja was the free, loyal assistant of Velázquez until the latter’s death in 1660. The last decade of Pareja’s life was spent in the employ of Velázquez’s daughter, Francisca de Silva Velázquez y Pacheco, working as an assistant to her husband, the noted portrait and landscape painter Juan Bautista Martínez del Mazo. Pareja’s undisputed masterpiece is “The Calling of St. Matthew,” housed at the Prado Museum in Madrid. Expertly done, in some respects it is reminiscent not only of certain works of Velázquez but also those of the great Italian and Dutch masters. Proud of his best effort, he inserted himself opposite Jesus standing at the left edge of painting holding a slip of paper that reads “Juan de Pareja in the year 1661.” Like his mentor, he too excelled in portraiture, the prime example being his portrait of the architect José Ratés Dalmau. Revered as one of the premier Spanish Baroque painters, Juan de Pareja died in Madrid in 1670. His legacy, however, continues to this day. The popular children’s novel I, Juan de Pareja by Elizabeth B. de Treviño, based partly on often repeated myths about the artist, won the American Library Association’s Newbery Award in 1966. Five years later in 1971, Velázquez’s portrait of Pareja was purchased by New York’s Metropolitan Museum of Art for an estimated $6 million. J. M. Pita Andrade, Corpus velazqueño, 2 vols. (Madrid, 2000), documents and texts; Robert Fikes Jr., “Juan de Pareja and Sebastian Gomez: Masters of Spanish Baroque Painting,” The Crisis (February 1980).